Farnam Block is down, now what? 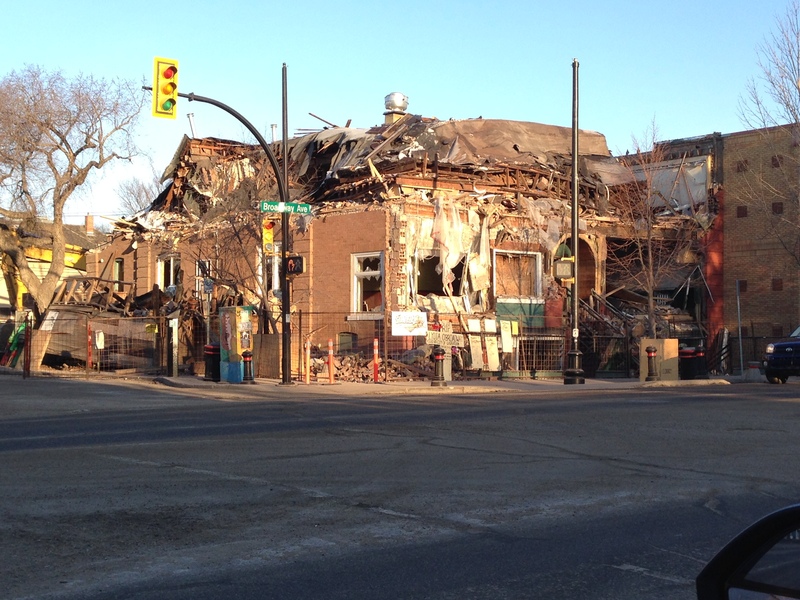 All the protesting and upset aside, the iconic Farnam Block on Saskatoon’s Broadway Avenue is no longer. Jordon Cooper from the Star Phoenix nailed it this week in his commentary regarding the reality of the building demolition. What I’m most intrigued about is what the next use will be for the site now that the structure is gone. The owners of the property have repeatedly told media that they don’t have an immediate use for the property but that doesn’t mean we can’t speculate here. To be fair, I think it’s commendable for the City to protect historic property but that doesn’t outbalance the economics at play here. The necessary upgrades needed for the Farnam Block simply outweighed a reinvention of it. Permitted uses include multi-unit dwellings, hotels, restaurants, lounges, retailers, medical clinics, vet clinics, and schools. The list is very extensive and also includes discretionary uses of special needs housing, child care centres and night clubs. A downside to the zoning is that it falls under architectural control restraints, such as building heights of no less than two storeys but no more than three storeys. Because the Farnam Block sat on a corner, the City could relax height restriction by providing a modest concession. The zoning further spells out what types of exterior finish they recommend (brick, stone, glass) and don’t recommend (vinyl siding, plastic, mirrored glass) to developers for exterior finishes. Even without a specific redevelopment plan, the demolition is likely a wise idea on the owners’ part. The first relief to the owners will be negating their liability which comes with a deteriorating structure. Secondly, would be the considerable decrease in property taxes. In both cases, the owners can afford to sit on vacant land contemplating their next move for far less cash than holding onto the vacant building and shouldering even bare bones maintenance as required. The ability to erect a temporary parking lot seems the most logical use for the foreseen future, similar to what the owners of the old Patricia Hotel site are doing post-demolition. This provides modest cash flow for the owners but also requires the site be maintained in a clean, tidy manner which is good for surrounding neighbours. In any case, the landscape has certainly changed on Broadway. What comes next is anyone’s guess… only time will tell.